It’s called Café Hamam and is right next to Nireas, the seafood restaurant I talked about in my last post. This is a small, family-run place with seating on a pleasant terrace outside, and it was where I tried fava for the first time. Fava is actually a Santorini specialty, and, while I did see it on offer here on Rhodes and in other parts of Greece, the best I had was definitely on the island of Santorini itself. 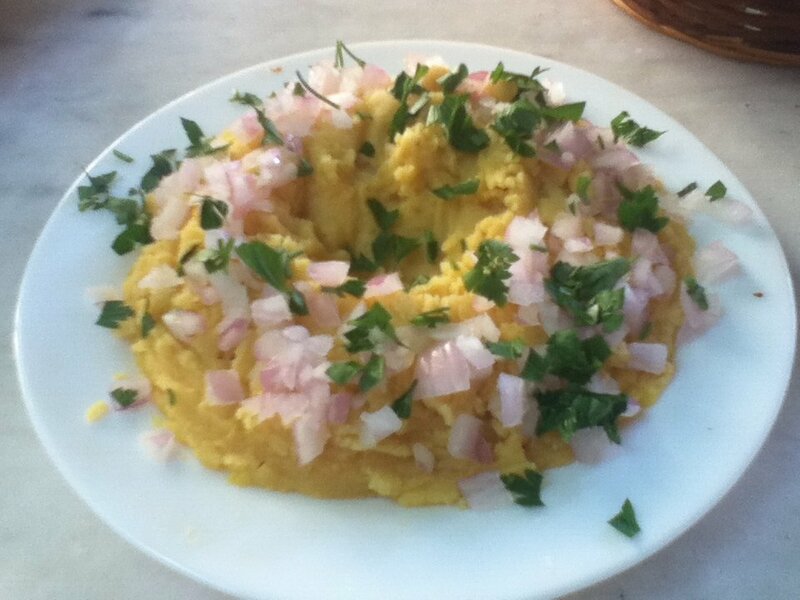 The word fava does not refer to fava beans in this case; rather, it is a dip made of mashed yellow split peas. The fact that many restaurants in Santorini translate this dish as “fava beans” in English only serves to confuse matters. The beans known in English as fava beans or broad beans are called “koukia” in Greek. I was told that they are a Cretan specialty but never managed to track them down while we were on that island. 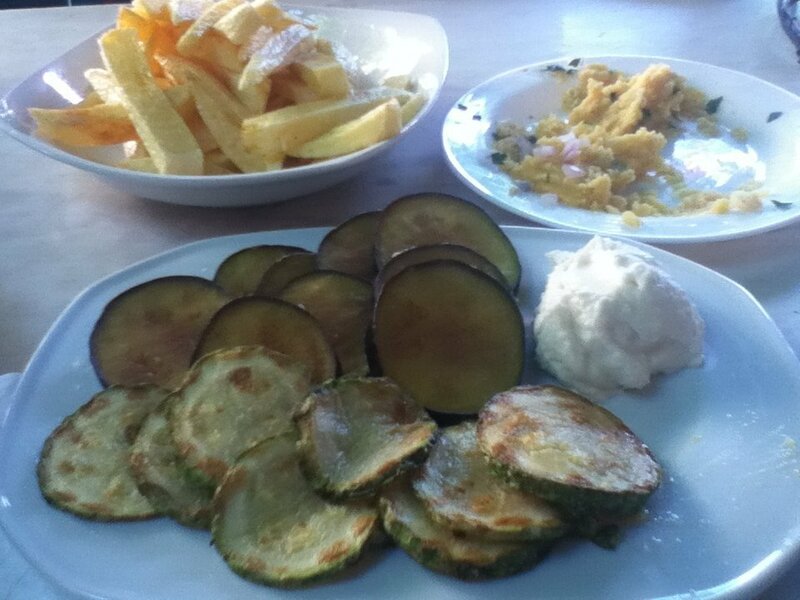 In addition to the fava, I also ordered French fries and fried eggplant and zucchini. Fried zucchini is a particularly common item found on Greek menus, and is one that’s often paired with a dairy-based dip such as tzatziki or yogurt, so you should ask about this when you order. This time, however, it was served with a generous dollop of skordalia, which is basically mashed potatoes with lots of garlic, though it can sometimes include a soft cheese or béchamel sauce, so again, you need to ask if it’s nistisimo. The next restaurant we tried was a tavern called Sifonios Kelari that was attached to a distillery selling different kinds of liqueur. I’m a bit conflicted about how to review this place. I’ve got to be honest and say that the food I had there wasn’t that good. In fact, it was probably the worst meal I had in all of Greece. But I hate saying that, because I really wanted it to be good! It was such a lovely little place tucked back in a cobbled alleyway away from all the tourist hubbub, and the guy who ran it was very friendly. And Nick thoroughly enjoyed his (non-vegan) meal, so perhaps I just ordered poorly. Admittedly, vegan options were fairly limited. They did have fava and grilled vegetables on the menu, which probably would have been the better choice, but since I’d just had those dishes for lunch I wanted to try something different. In the end I went with the green salad and the black-eyed peas. The green salad was, well, very green! 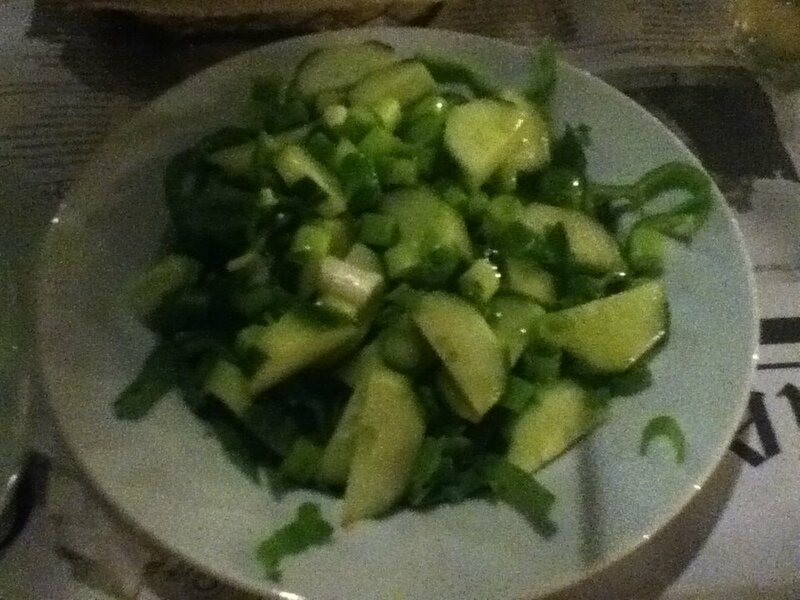 It included cucumber, green onions (scallions), green bell peppers (capsicum) and an unidentified leafy green vegetable. I found the onions to be quite overpowering. 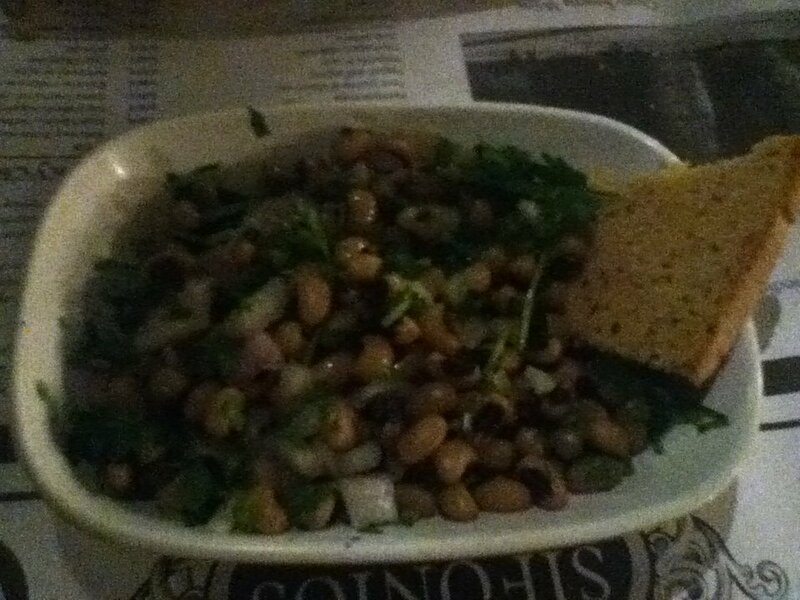 The black-eyed peas dish was an unusual offering, and one I don’t think I saw anywhere else in Greece. While I don’t often cook black-eyed peas at home or come across them in restaurants, they are actually quite typical of Southern US cuisine, so eating them reminded me of dinner at my Granny’s house when I was little, except I think hers were cooked with a rasher of bacon. For me, the best part of the meal was the very tasty digestif that the server offered us on the house, which was a mix of ouzo and coffee. I don’t even like coffee, but this was delicious. Supposedly this distillery was the first in Rhodes to create this concoction, though others have since copied the idea. 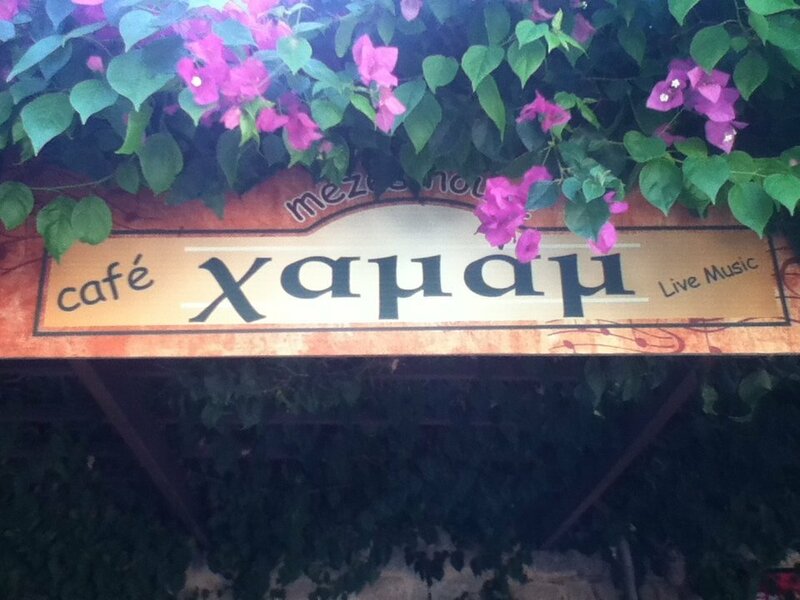 Even if you choose not to eat here, you might want to pick up a bottle of ouzo di café from the attached shop. OK, we’ve now come to our last meal on Rhodes, and I’ve saved the best for last! The restaurant is called Island Lipsi (Niki’s Place). It’s definitely closer to the hustle and bustle of the old town than Sifonios, but the food was fantastic! I really wish we had discovered this place sooner. The menu was extensive and appeared to have plenty of vegan or easily veganized options. In addition to the traditional Greek dishes, they also served things like pizza and pasta. Now, they were obviously catering to the tourist crowed by doing this, which is usually a bad sign, but we both found the food to be delicious, and the service was very friendly too. 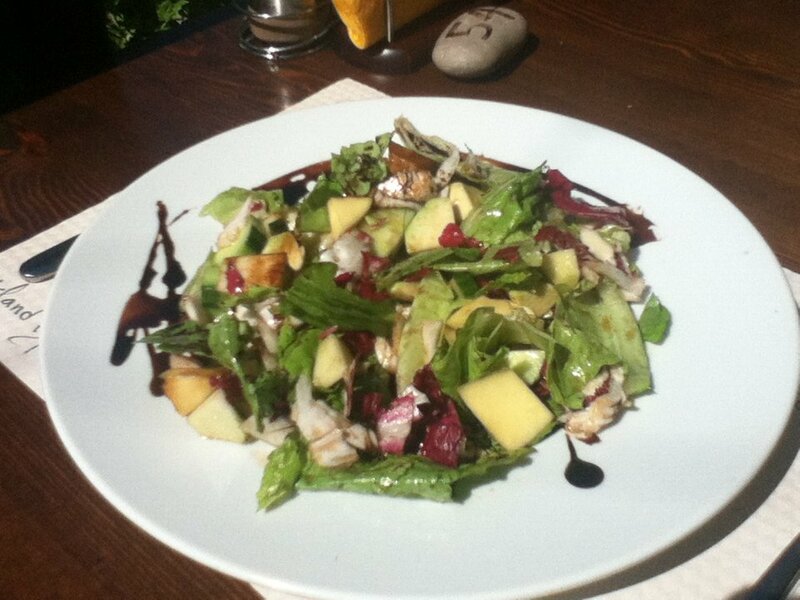 I chose the Mediterranean salad, which included lettuce, mango, cucumber, avocado and apple topped with a sweet-tasting balsamic vinegar dressing. This salad was way better than the green salad from the night before and really made by day. In addition, Nick and I also shared a portion of hummus with seasoned pita bread. Now, let’s get one thing straight – hummus is not a Greek dish. Rather, it is a Middle Eastern dish that is served throughout the Levant. It’s actually a bit of a cliché that tourists always come to Greece expecting to eat hummus and get annoyed when they can’t find it on any menus. Apparently it is often served in Greek restaurants outside of Greece, but I don’t often eat in Greek restaurants so I can’t vouch for this. 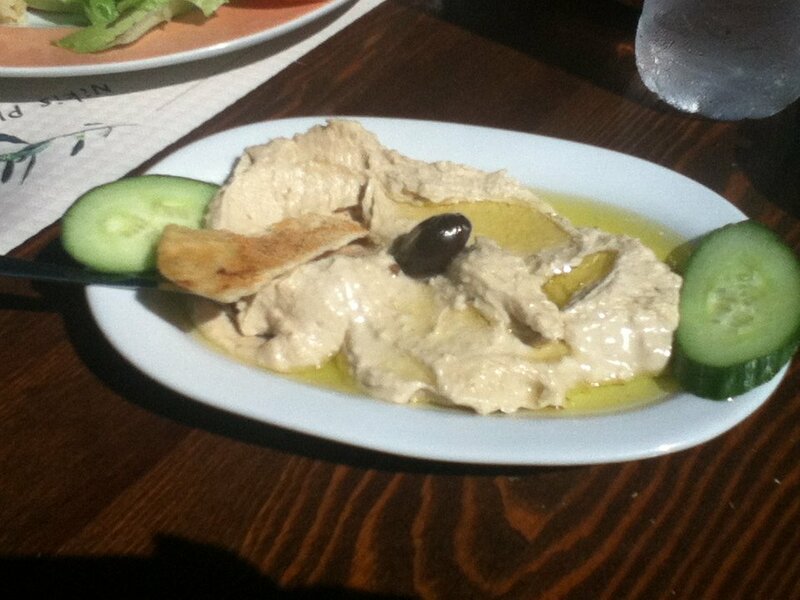 However, I can tell you that hummus is one of my all-time favourite foods, so I was very excited to see it at Island Lipsi, even if it’s not authentic Greek cuisine. And there was one more thing that gave this meal an extra-special touch. 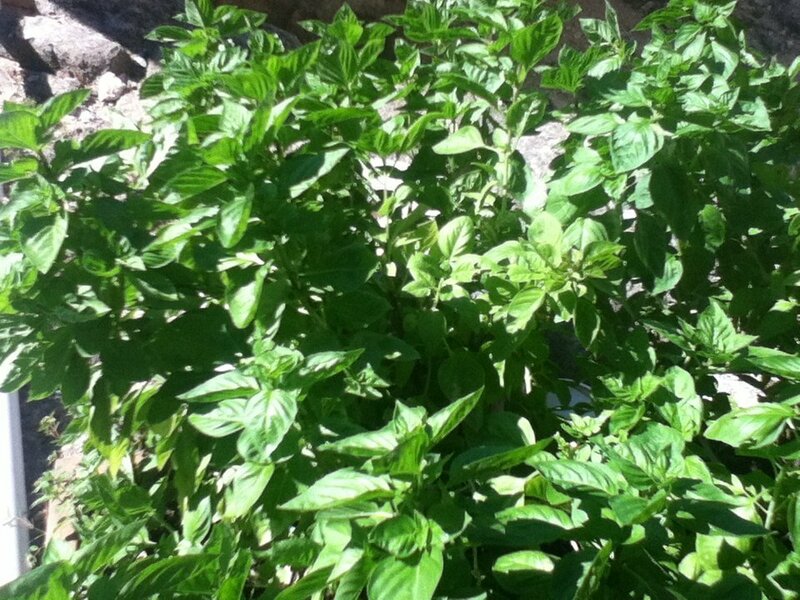 As we were waiting for our food to arrive, we noticed that we were sitting right next to a gigantic basil plant growing just on the other side of the railing that separated the restaurant from some ancient ruins. I couldn’t pass up this opportunity, so I picked off a few leaves of fresh basil and added them to my salad to make it even more Mediterranean. I should also mention that this was the first time we experienced what turned out to be quite a common occurrence in Greece – free dessert brought to our table at the end of the meal. We saw this particularly often on Crete, where after awhile we came to expect a bottle of raki and a pair of desserts with every meal. Unfortunately, the latter are rarely vegan. In the beginning I just let Nick have both portions, but after he protested that Greece was making him fat I started politely turning mine down. How you want to handle this situation is of course up to you, but it’s good to be prepared for when it happens. If you’re eating with a non-vegan you might want to bring your own treat with you, ’cause let’s face it, it’s never much fun to sit and watch someone else eat dessert. But hey, at least there’ll be raki to numb the pain.